Smoothies are fantastic when you are on the go. When life gets busy, I love how simple and quick it is to whip up a smoothie yet still give my body the nutrition that it needs even though I may be short on time. I particularly love smoothies for breakfast since I’m not good at making myself sit down in the mornings for a proper meal. One can enjoy smoothies any time of day as a quick meal, not just mornings. Smoothies are great for snack time too! Smoothies are packed full of delicious and good-for-you nutrients. They can help to boost your energy and taste fantastic. Recently, Walmart featured several smoothie recipes in their weekly ad. As a part of the Walmart Moms, my family and I tried out the Kale Fruit Smoothie that was featured in the ad. I picked up all of the ingredients I needed to make the Kale Fruit Smoothie from our local Walmart store. I love that my kids likes smoothies just as much as I do because it is so easy for them to get plenty of fruits and vegetables when it’s in a tasty drink that is easy to take with you when you are on the go. The Kale Fruit Smoothie has only a few ingredients and couldn’t be easier to make with just the use of a blender. In this smoothie you get all of the health benefits from bananas, apples, strawberries, blueberries, greek yogurt, soy milk, and kale. The various health benefits that comes from the variety of foods that we eat fascinates me. 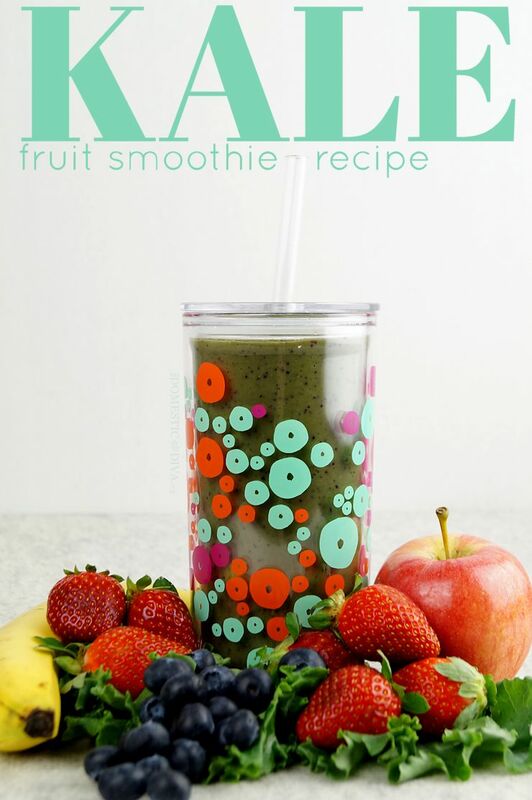 By following the recipe for Kale Fruit Smoothie on walmart.com you’ll make enough for two servings and it takes less than 5 minutes to make in your blender! To make getting all the nutritional benefits of smoothies at home a little easier, make your own smoothie packs by placing fruits and veggies together in a freezer bag and freezing them in individual portions. When it comes time to make your smoothie simply remove your frozen fruits and veggies from the freezer, place in a blender with your liquid ingredients, and blend it up. By using frozen fruits and veggies in your smoothies, your smoothie will stay colder longer and not require the use of ice that can often water down your smoothie as the ice melts. 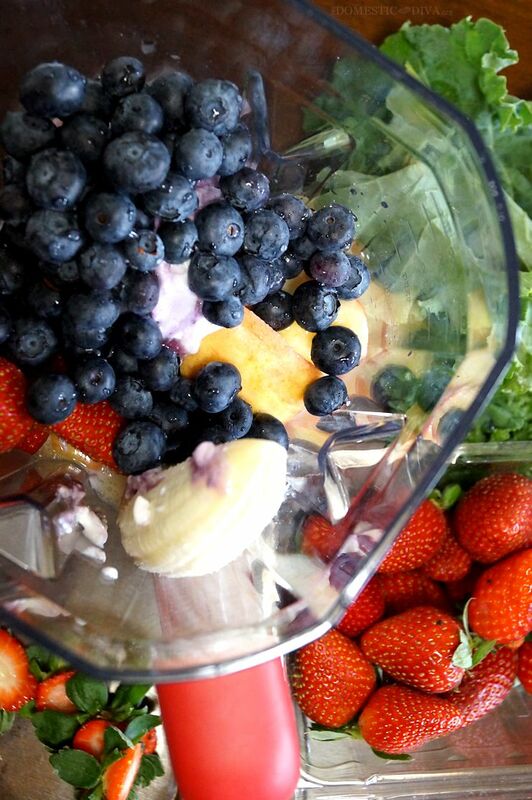 What combination of fruits and vegetables are your favorite when creating a smoothie? Head on over to walmart.com to grab the recipe for the Kale Fruit Smoothie that I’ve featured in this post as well as many more delicious smoothie recipes. Disclosure: As a participant in the Walmart Moms Program, I've received compensation for my time and efforts in creating this post. All thoughts and opinions are my own. My favorite combination is spinach, kale, chia seeds, cucumber, apple and lemon. 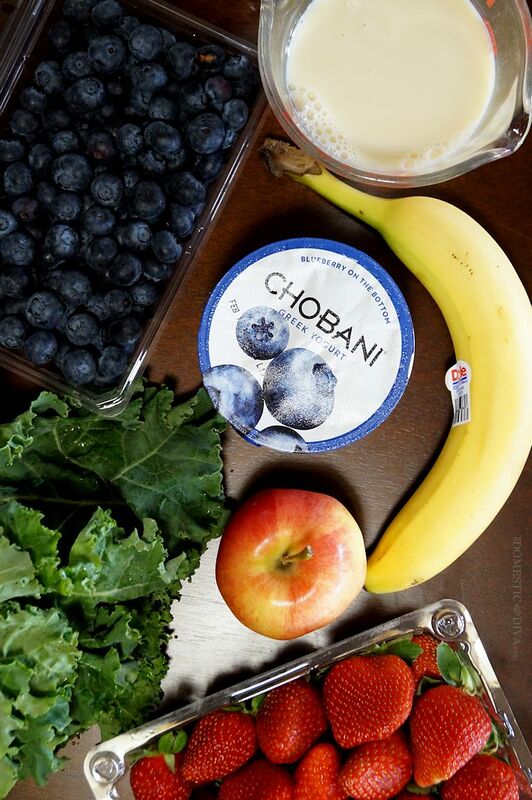 Great for a breakfast smoothie. Great looking smoothie! Thanks for the recipe.